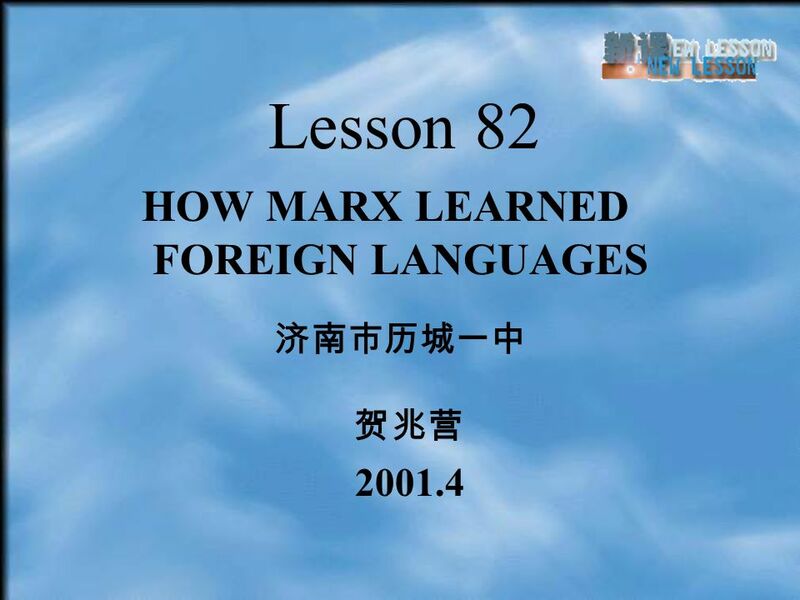 HOW MARX LEARNED FOREIGN LANGUAGES Lesson 82 2001.4. 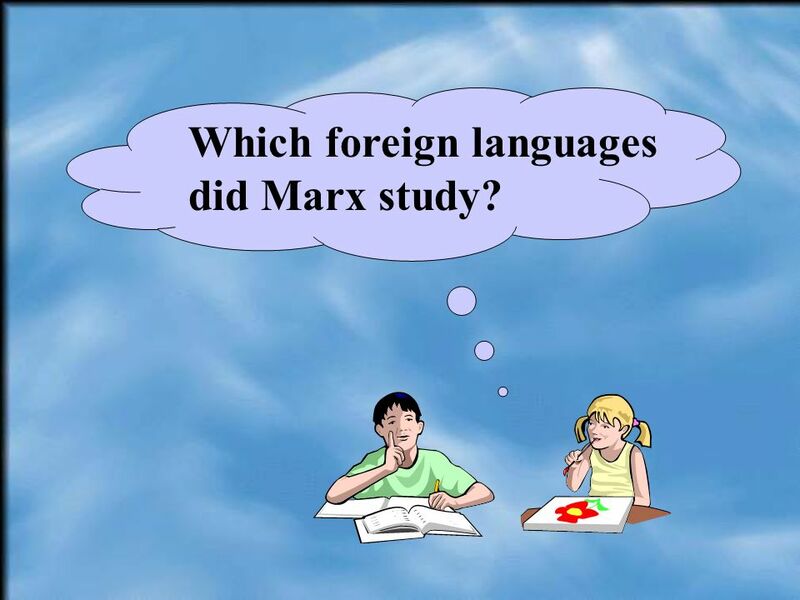 4 Which foreign languages did Marx study? 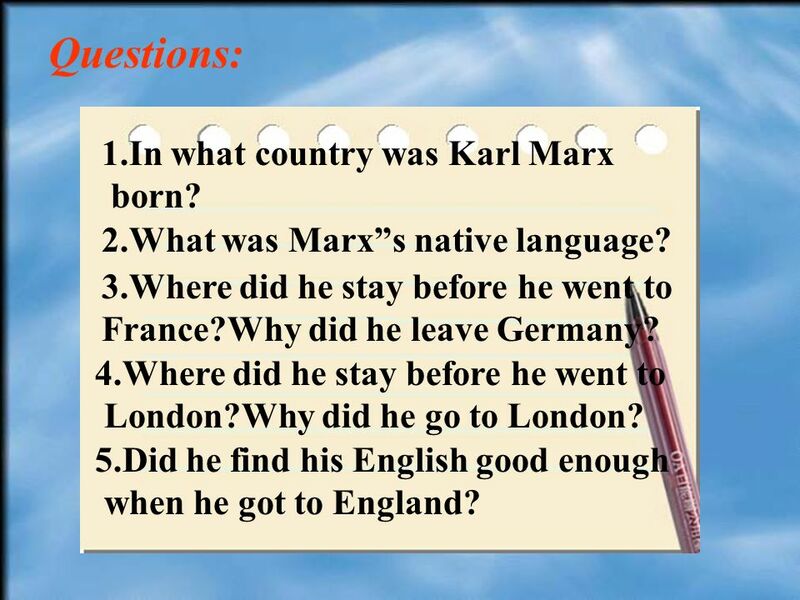 8 Questions: 1.In what country was Karl Marx born? 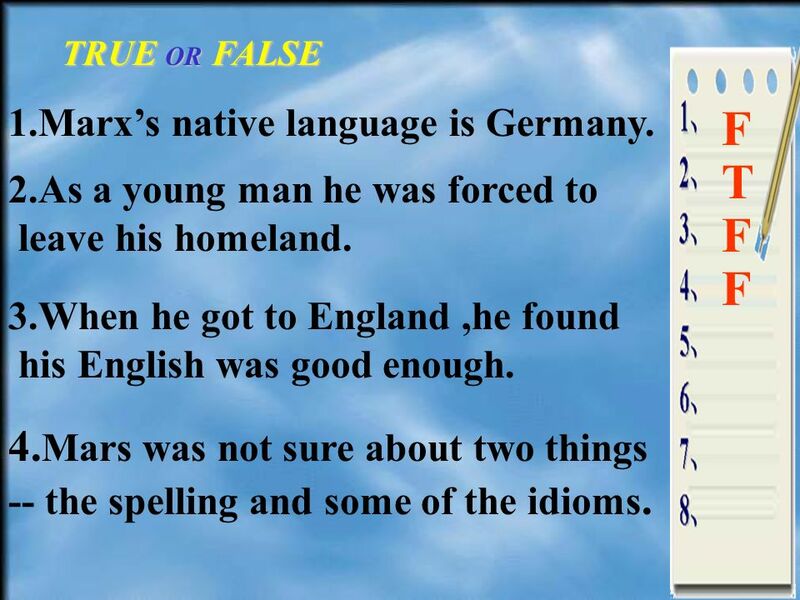 2.What was Marxs native language? 3.Where did he stay before he went to France?Why did he leave Germany? 4.Where did he stay before he went to London?Why did he go to London? 5.Did he find his English good enough when he got to England? 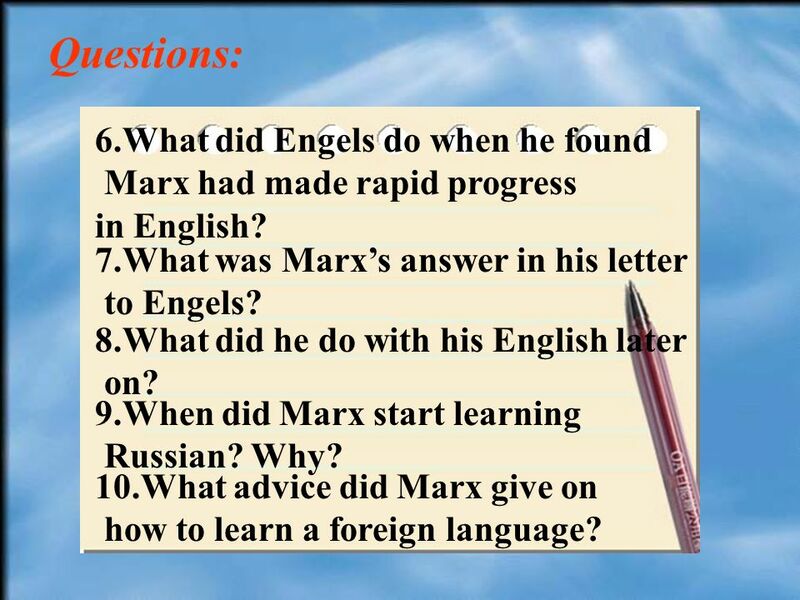 9 Questions: 6.What did Engels do when he found Marx had made rapid progress in English? 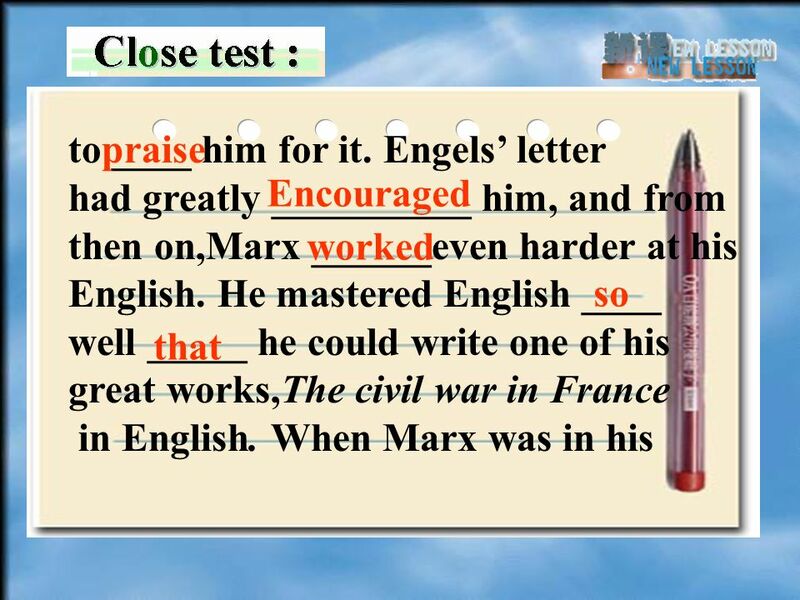 7.What was Marxs answer in his letter to Engels? 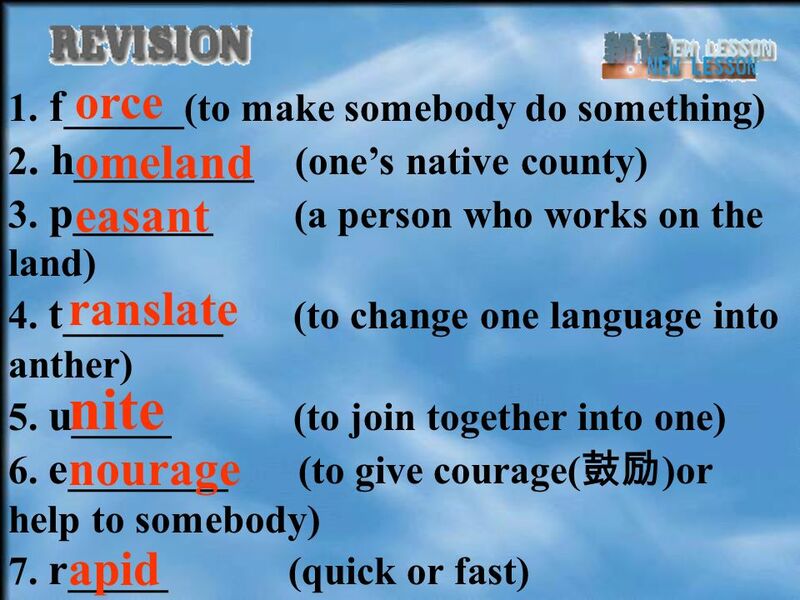 8.What did he do with his English later on? 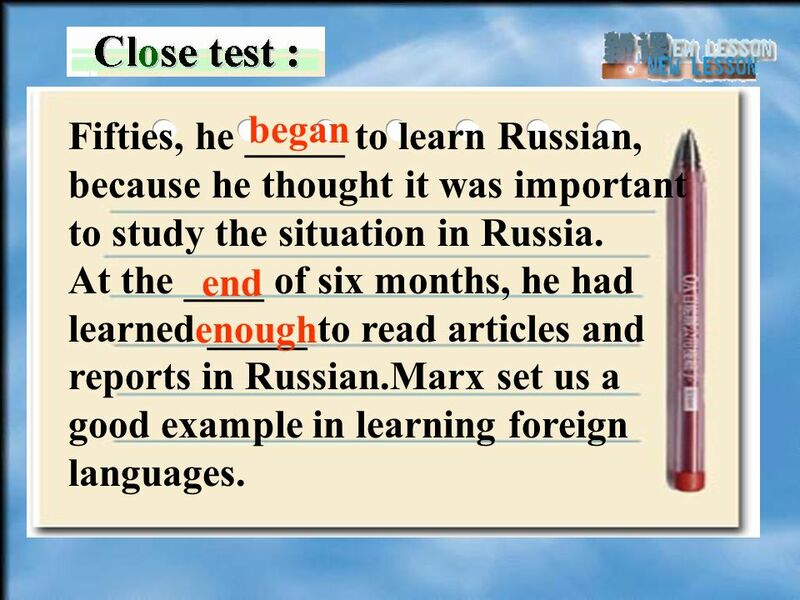 9.When did Marx start learning Russian? Why? 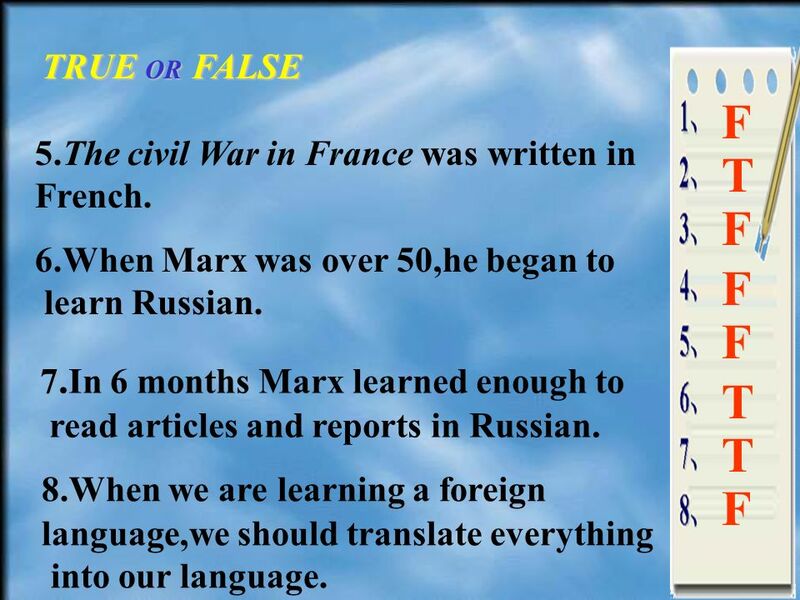 10.What advice did Marx give on how to learn a foreign language? 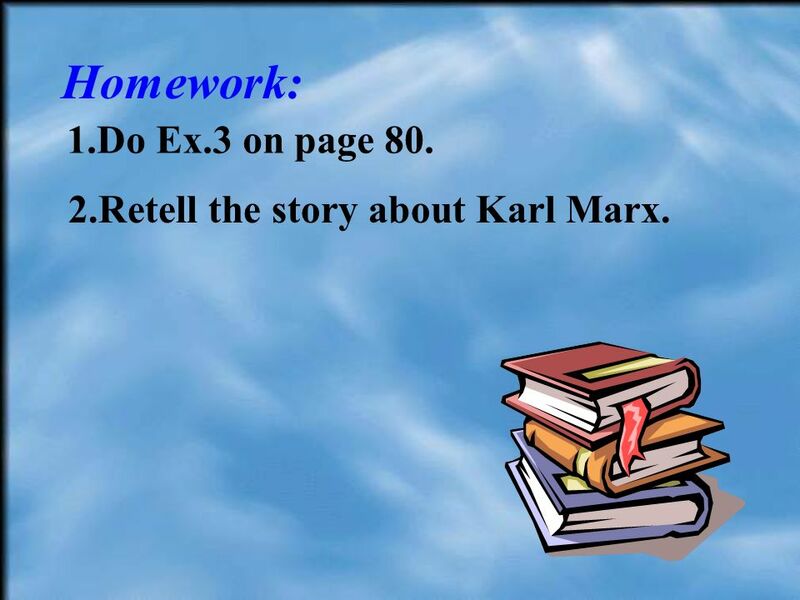 15 Homework: 1.Do Ex.3 on page 80. 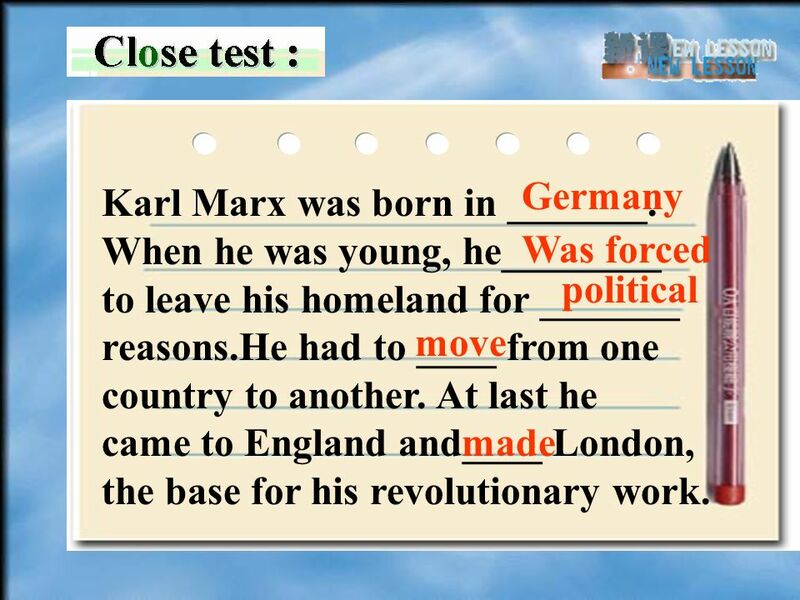 2.Retell the story about Karl Marx. 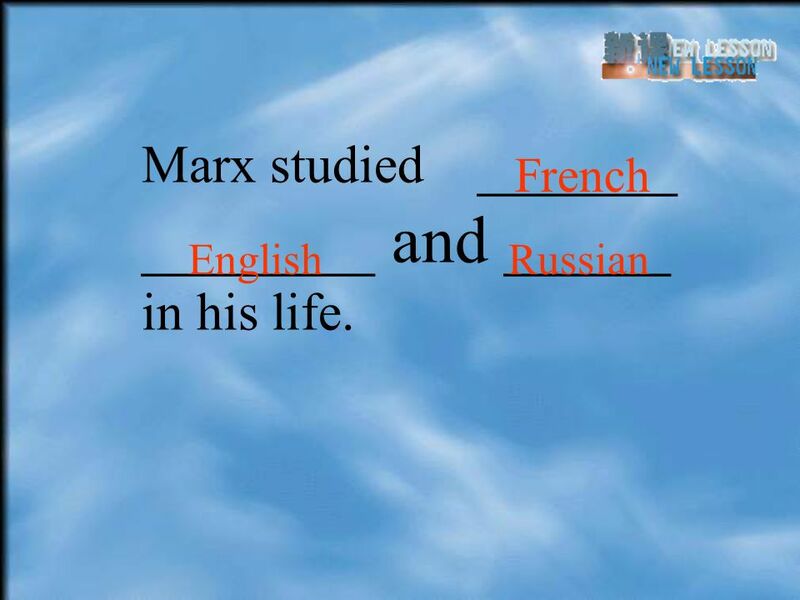 Download ppt "HOW MARX LEARNED FOREIGN LANGUAGES Lesson 82 2001.4." March 26 – The Stranger Agenda: Readings: “The Absurd Man” “The Absurd Hero” The Stranger Reading a Translation Reading The Stranger Take out: Pen/Pencil. 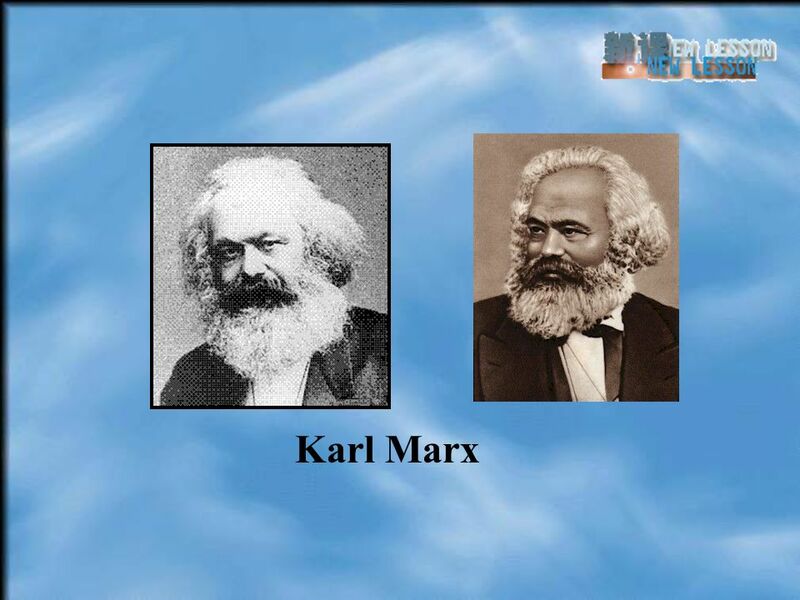 Karl Heinrich Marx The Legend. 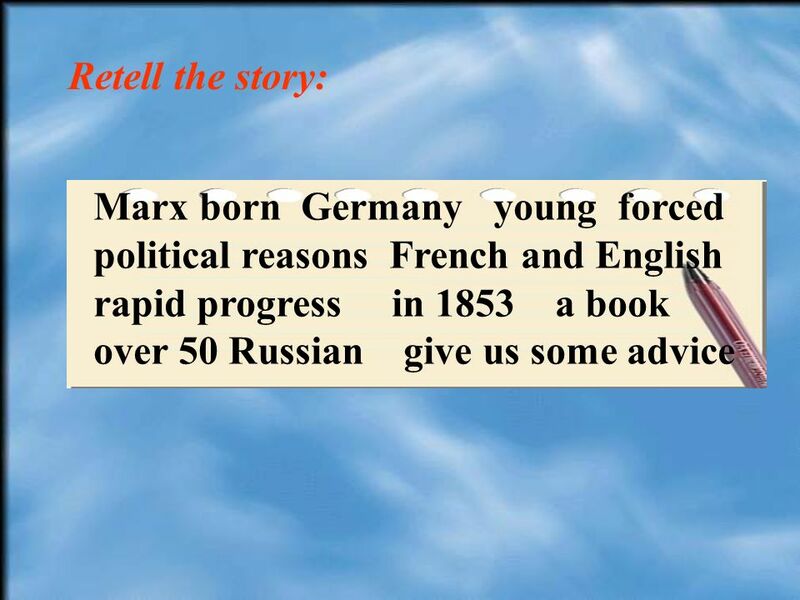 The Story.. KARL MARX German Philosopher -Economist and journalist -Wrote the Communist Manifesto -Father of. 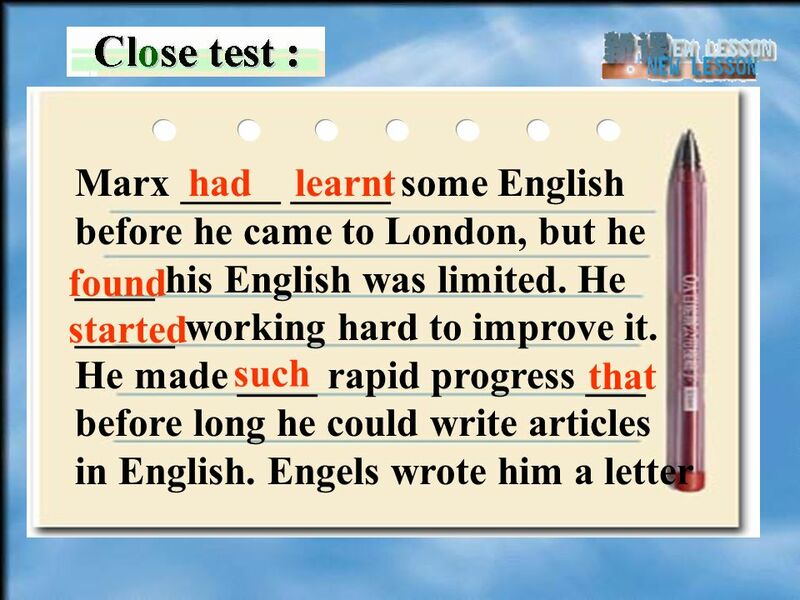 HOW MARX LEARNED FOREIGN LANGUAGES Lesson 82 Karl Marx German Germany. About the Author … George Orwell’s real name is Eric Blair. Alien & Sedition Acts Presentation by Robert L. Martinez Primary Content Source: The New Nation by Joy Hakim. Images as cited. 课标人教实验版 高一 Module 1 Unit 5. Listening 湖南 李日光 Listening P37 Using Language. BROCHURE ON THE IMPORTANCE OF NATIVE LANGUAGE Native language Native language is man’s most important language. It is the language of feelings and thought.